As a long time supporter of ethical and sustainable fashion brands, I’ve always, quite frankly, felt a bit torn about whether or not to shop at Madewell. I love and admire their high-quality pieces, but have a personal conviction to shop exclusively from sustainable and fair trade fashion brands whenever possible. However, this hasn’t stopped me from purchasing several Madewell pieces that I knew would be worn over and over again. I also seek out Madewell when shopping from consignment or pre-owned clothing stores because their clothes are just that good! This is why I nearly jumped up and down with excitement when I discovered Madewell was releasing a Fair Trade Denim line! In my opinion, this is a monumental step for the entire ethical fashion community! Why? First off, a VERY popular brand (and their parent company J. Crew) is releasing a Fair Trade Certified line. It’s not just “sustainable” or “Eco-friendly” as other large brands have advertised for marketing, but actually Fair Trade Certified. One of the biggest obstacles to shopping Fair Trade Certified clothing is that it mostly has to be done online. Now consumers have access to try on Fair Trade styles in person at Madewell and J. Crew stores across the globe! This also means that other brands will be watching and taking note. Eco-friendly and sustainable have become buzz-words that many large brands (such as H&M) have taken advantage of by releasing eco-conscious lines. However, there are sometimes only small aspects of the line that are actually ethical or sustainable. With Madewell’s jeans being Fair Trade Certified, we don’t have to question whether it’s the real deal or just a marketing ploy. Meeting standards for Fair Trade Certification is not an easy task, so I know they are working with a premier Fair Trade Certified factory to have these jeans made! Now, let’s get to the review! 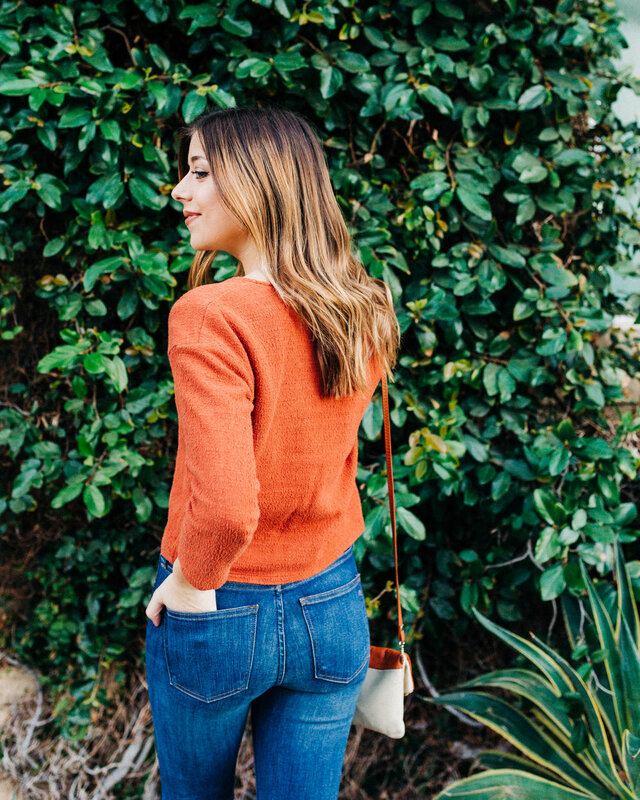 I tried out three pairs of Madewell jeans, and they did NOT disappoint! I’m a denim girl - through and through. Jeans are my go-to look, but they have to be comfy and flattering to make the cut! I can honestly say that I LOVED all three pairs, which is not surprising considering that Madewell is known for making exceptional jeans. I’ll admit, I was very hesitant about this style, but I wanted to try something new as jean trends move away from skinnier styles. I ended up being pleasantly surprised by how flattering and comfortable these were! The only con is that I decided to order the petite per the website’s suggestion (I’m 5’4”), and wish I would have gone with the regular length. They were just a tad shorter on me than I’d like, so I’d suggest ordering the petite if you’re 5’3” and under. I loved pairing these jeans with my paloma mules from Nisolo to add some extra height/lengthening to my legs! What I love: High waist, stretchy material, fun unique style, offered in petite, regular, and tall sizes. This is the perfect sweater to transition from winter to spring, I found it secondhand and I wear it with EVERYTHING. Love the slight crop - so flattering, and currently on sale at Nordstrom for 40% off! I had to create an extra hole in the belt since it’s a size small, but they’re releasing sizes XS and XL soon! I had been on the lookout for an ethically made belt, and this one was perfect! These have instantly become my new favorite pair of jeans. I’ve probably worn them ten times since I got them two weeks ago, and that’s no exaggeration! I tried the 25 at first and ended up returning to size down to a 24 as these have a thicker material than the other two pairs and aren’t as stretchy. I love the light wash, the high rise, and the slightly straight (not quite skinny) legs that go perfectly with any and all outfits! They almost have a vintage-y feel. These jeans are ultra flattering, very comfy, and go with everything! For only $98, these can’t be beat! This is a perfect classic pair of jeans! Most of my skinny jeans have holes in them, so I was excited to receive a pair of casual jeans without distressing. These are SO soft and comfy, I could live in them! I’m 5”4, and these went a bit too long on me to be a true “ankle jean”. I’ll probably just cut them an inch or two more to turn them into ankle jeans, but they also look great cuffed at the bottom as they are in these photos! There you have it! My comprehensive style guide to three pairs of Madewell’s new Fair Trade denim line. Head into Madewell to try them yourself, or try ordering online (you can’t go wrong with free returns). Last but not least, a huge thank you to Madewell for gifting these jeans to me so that I could write this review! I am a huge fan of Madewell jeans, and am looking forward to future Fair Trade styles being released. *This article contains affiliate links and some items worn were gifted for the article. All opinions are 100% my own. Style Me Fair could not exist without the loving support of brands and readers, thank you!